This workshop was presented by Thomas F.R. Clareson who is the Senior Consultant for Digital and Preservation Services at LYRASIS and Linda Langschied who is the Digital Projects Librarian at the Scholarly Communication Center, Rutgers University Libraries. It was provided by the New Jersey State Library and the Conservation Center for Art & Historic Artifacts (with generous funding from the Institute of Museum and Library Services). So, I drove to WheatonArts in Millville, New Jersey, early in the morning for another amazing conference venue! WheatonArts is a fun place to visit, especially if you like glass (see below). Tools you can use for scanning and quality control. Making practical planning decisions: in-house or outsourcing. Practical planning decisions for staffing and budgeting. This was an excellent, fast-paced conference. I learned much and was given a "book" of useful information to consult. WheatonArts is a national cultural treasure. Located on 65 wooded acres in southern New Jersey, WheatonArts is home to the Museum of American Glass, the Creative Glass Center of America International Fellowship Program, the largest folklife center in the Garden State, a hot glass studio, several traditional craft studios, five museum stores, a 13,000 sq. ft. Event Center and a beautiful pond-side picnic grove - a true Pineland Sanctuary! This presentation, at the Frederick County Museum of History, was free, and was delivered by Michelle Kershner, Marketing and Communication Manager for Visit Frederick. Michelle talked about being deliberate about what you share (or not). Ask questions such as "Is this piece of news worthy of sharing on a social network?" And, if so, "How can we make it relevant?" For example, if the boss thinks his or her dental practice should share the fact that the accountant won an award, you might put up a photo of the accountant with a big smile and say, "Ann, our accountant, flashing her pearly whites, won an award. . ." to help fit the message in with the promotion of the business. Besides having lots of practical ideas for how to use social media to promote your business, non profit, repository, museum, etc., Michelle introduced us to some new ideas and resources. I didn't know about Hootsuite (and other sites) that will shorten URL's. She also mentioned using Animoto (embedded video) for putting free short video clips on your site. Michelle demonstrated how she put a photo on Visit Frederick's Facebook page and discovered someone used it in another place that gave greater exposure, and it was eventually picked up and used by CNN for an even wider audience. Also, the City of Frederick won a "Prettiest Painted Place" award, and she showed how she used social media to spread around the positive publicity that came from that. 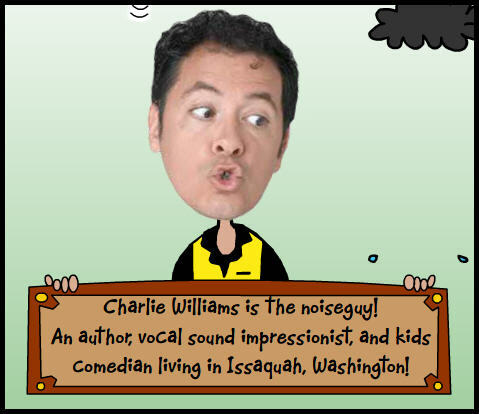 Charlie "Noiseguy" Williams was well worth watching. I make sounds with some of the books I read to my kids but not even close to what he does. Some of them I've been practicing and some of them I can't do (high pitched ones.) He shows what a big difference it makes when telling a story! All food items are served with biodegradable service ware and napkins. They might not be the prettiest forks and knives you've ever used but gosh darn it, they're Earth friendly! 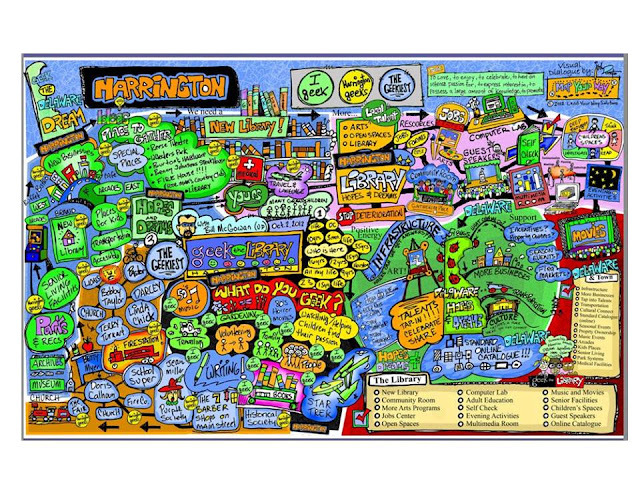 Here is the recording of a really great webinar about the ways that Delaware public libraries are connecting to their communities. The whole webinar isn't edge-of-your-seat-exciting, but it has some very cool moments that are worth the hour of your time to check out. 1. 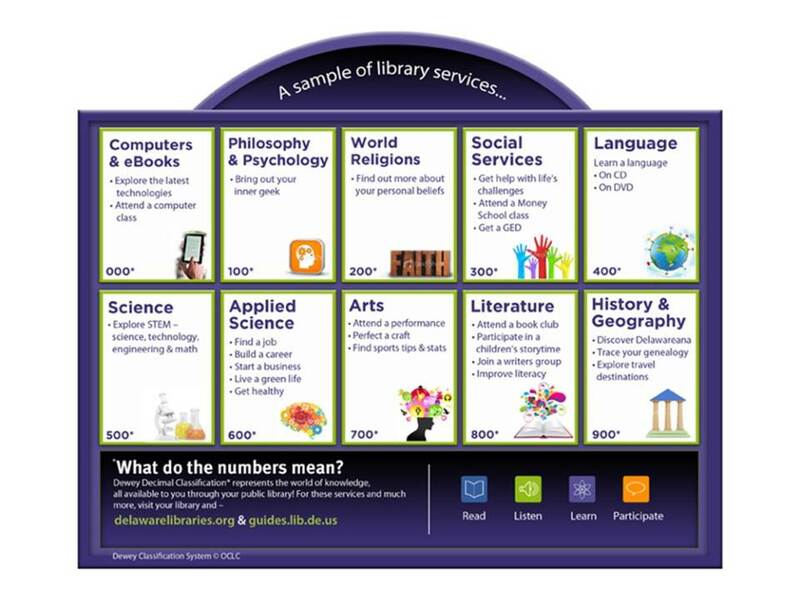 DE is using the OCLC "Geek" campaign to focus attention on libraries. The question is, what do you geek? For instance, I geek reading romance novels and I geek gardening. 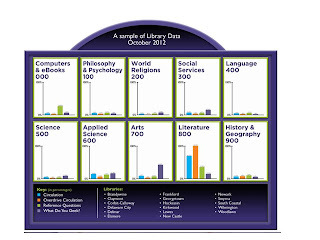 DE is collecting all of the things/ideas/areas that community members are excited about and taking it a step further by classifying those 'geeks' into Dewey Classification. In the below image, you'll see that they are classifying their circ info, Overdrive circulation, reference questions and what do you geek, into Dewey. They now have a visual guide of where to put programming energy, collection development and training. The image combines the "what do you geek" question with the ideas generated from the facilitated, "what are your hopes and dreams" discussions. DE also did What do you Geek billboard at three spots in the state. I love this campaign as a way of inspiring library staff and the community, using Dewey to promote collections, plan programming around engagement, speak to hopes and dreams and place libraries at the center of the community. Last favorite bit -- DE will be adding "ice-breakers at every program" to their Best Practices for Programing toolkit. Making connections and engaging the community is one of the best things that we can do as libraries (I think). Simple things like, everyone say hello to the person beside you and talk about what you are reading or listening to right now. Cool stuff! How can we adapt or adopt these ideas? On Friday, April 12th, I attended Leadership Washington County's Arts and Religion Day and it was by far my favorite of all the LWC class days. The thesis for the day was, "What opportunities are there for active participation in the arts in Washington County, MD?" 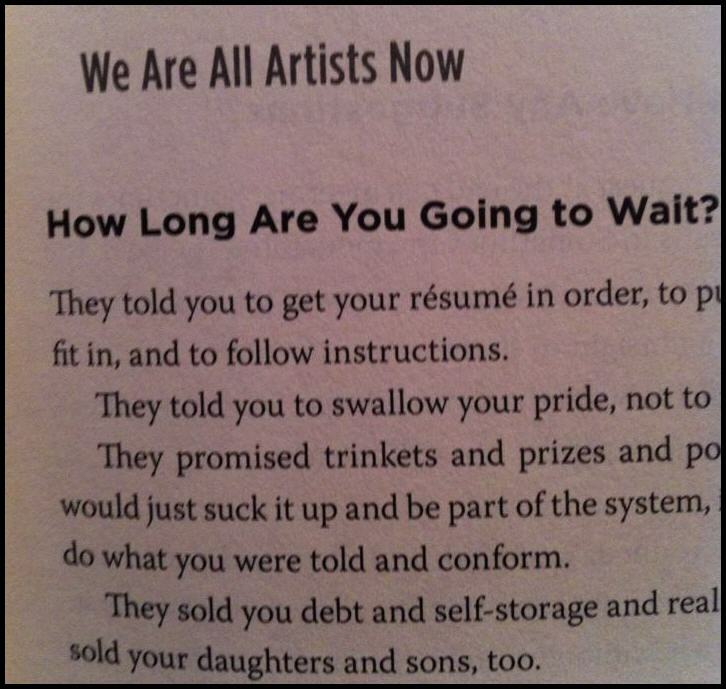 The short answer is: where aren't there opportunities for active participation in the arts? No, it's not for sale ... unless you want to buy it. We started our day at the Washington County Museum of Fine Arts where we split into small groups to go experience different artsy activities. My first stop was at the Mansion House (home to the Valley Arts Association) where we learned about the local artists' exhibits that are on display and how inexpensive it is for local artists to display their works of art there. 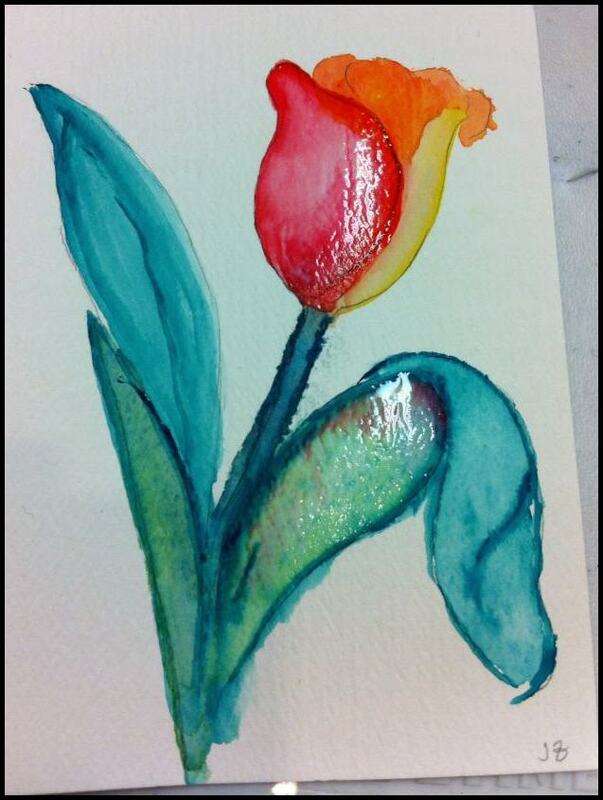 Then we got to do what ended up being my favorite part of the whole day: we learned how to paint with watercolors. I enjoyed it so much that I kept worrying that we were going to be told at any minute that we need to leave and go to the next part of our day! 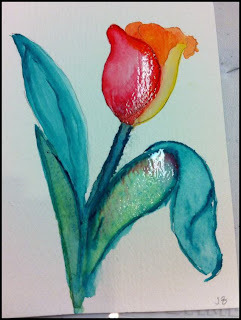 The artist who taught us is a professional watercolor painter and has created some astounding pieces for which I now have a much, much greater respect and appreciation for because I had a hard enough time painting the tulip you see above. After we painted, we went back to the museum and enjoyed a fascinating, albeit brief, tour of the collections given by a Master Docent. Much like with the watercolors, I found myself not wanting the time to end. There was so much to see and learn. One bit of information I picked up is how to appreciate a quality portrait. As it turns out, it's all in the eyes. I don't mean the "beauty is in the eye of the beholder," but rather a good portrait is measured by the quality of the painting of the eyes. Are they realistic - both up close and at a distance? A skilled portrait artist can paint extremely realistic eyes that are lifelike no matter where you stand to appreciate the work; if glasses are in front of the individual's eyes, that's even further evidence of an artist who is particularly gifted in this type of painting. The last little bit of our time at the museum was spent in their vault learning about their preservation and collection development efforts. The museum has roughly 7,000 pieces but only 10% are on display at any given time. When they aren't on display, the pieces are hung neatly in sliding metal cage-like slats, arranged solely by size. We got to hear stories about how the museum came by its one Norman Rockwell piece. A bastardized version of the story is pretty much the director of the museum at that time wrote a letter asking for it and Mr. Rockwell said, "Ok, give me a thousand bucks for it and it's yours." Moral of the story is: ask and ye shall receive...if ye has the money. Ok, so I'm being more than a bit flippant but it is amazing how much of the collection has been received simply through donation, and through folks and especially European institutions, selling pieces cheaply (especially after WWII) and wanting them to be in a safe place. I am looking forward to going to back to the museum and spending more time there. During lunch we were treated to a few performances by local poets and musicians, two of whom are the stars in the upcoming Barbara Ingram School For the Arts' musical, Legally Blonde. In the end, I found this day to be quite personally serendipitous because I had just that morning started to read Seth Godin's The Icarus Deception. 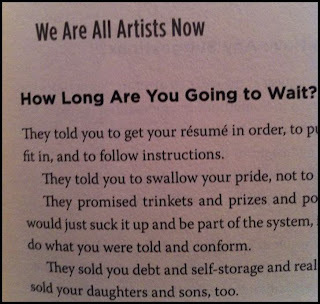 One of the very first lines in the book is, "We are all artists now." I consider myself an artist - both in the traditional and non-traditional sense - I write haiku, I melt bottle caps into other forms that I'm not quite sure what will happen with them but I'm convinced something artistic will become of them. But I think I'm most pleased with my non-traditional art - the way I am able to facilitate groups and use my words to craft emotionally intelligent and visually stimulating emails, articles, and Facebook posts (that actually move people to take my surveys, participate fully in brainstorming sessions, and buy 50 Get-A-Way raffle tickets). This actually got me thinking about our previous LWC days and how I wish we could do it all over again - knowing what we now know - and incorporate a little bit of each of the days into each other. For example, for the Cultural Heritage day that's coming up in May, I wish we could focus on cultural heritage but examine it through the lenses of human services AND education AND literacy AND local gov't AND business and economics AND arts and religion, etc. Do you get the idea? Hmm, wait a minute, aren't I a part of the cultural heritage group? 1. "If the person you're selling to agrees to buy will his/her life improve?" 2. "When your interaction is over, will the world be a better place? "If your answer to either of these is no, you're doing something wrong." COPYRIGHT (confusion) for Librarians and Archivists! Attended by Elizabeth Howe on Monday, April 1, 2013. Just kidding. This workshop was really called "Introduction to Copyright for Librarians and Archivists." I added "confusion," because this subject is often confusing! Nevertheless, I learned or reviewed a lot of "rules" and was supplied with the best handouts ever for future reference. Peter Hirtle (copyright guru), from Cornell, is an excellent instructor. He kept the day "fun" with interesting stories of lawsuits that have occurred or are occurring over copyright issues. He also had asked us to email specific questions ahead of time that we discussed during his presentation. My questions were about copyright of actual newspapers, and newspaper microfilm, so Mr. Hirtle helped me understand those issues. A couple other points he made that I remember are that libraries and archives rarely get in trouble with copyright, and if they do, they often just receive a request to "cease and desist." If needed, it is wise to protect ourselves with messages such as "in good faith I did my best to find the author or artist or photographer, etc. -- to get permission from the copyright owner." Also, this workshop has inspired me to put up signage in the WMR that puts responsibility on the patron for how copies made in our repository are used. One of the most awesome aspects of this workshop was the venue. It was held at the Buena Vista Conference and Reception Center in New Castle, Delaware. The Conference Center is a state-owned historic property built in 1842, formerly the governor's mansion. Also, New Castle is the location of Oak Knoll Books, so I had the pleasure of visiting their rare book shop after the workshop was over. Charlie Noiseguy's presentation was certainly entertaining- I didn't really even look at the clock. 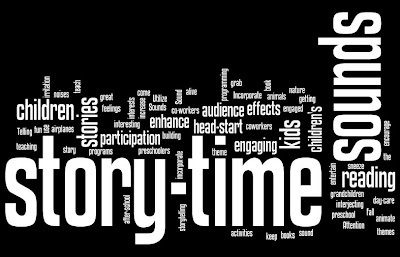 I thought that this would be a good workshop to attend to help me improve my storytimes. Noises really can make a difference. Some of the noises, like the horse and the airplane, will definitely prove useful. Some, like construction noises, with a bit of practice, might just come to me. Unfortunately, there were many that I couldn't make (I will never, ever, be able to whistle!) Still, it was a great afternoon of training. Dan Pink - "To Sell is Human"
Some of us are "non sales" sales people. We may not directly work in sales, but we still sell. I really enjoyed this presentation it was so unique. In my opinion it's one of the best ones I have ever attended. Some of the noises he made I couldn't do in a million years, but some of them I can, and will use in my story time programs. Thank you Julie for finding him for us. This is the kind of training that helps us grow as children's librarians. If I ever have the chance, I will go to see him again. On Monday, April 8th, 27 children's specialists from Allegany, Garrett, and Washington counties' public libraries, health departments, and higher ed extension offices came together in the LaVale library to participate in, Sound Advice with Charlie 'Noiseguy' Williams. This does not mean they are immune to the email that is destined to arrive in their inbox one of these days soon, asking them to share their learning reflections to the blog. I wanted to share the aggregated results of the evaluations with you because both the numbers and the free-responses are fairly insightful. Participants assigned a 1-5 rating to the following questions, with 1 being the lowest and 5 being the highest. Question 1: How well did the presenter keep you engaged? Question 2: How well did the presenter display knowledge of the material? Question 3: How helpful was this material to your work at the library/school/organization? Question 4: How good a use of your time was this training? Question 5: How might you use what you've learned at work? 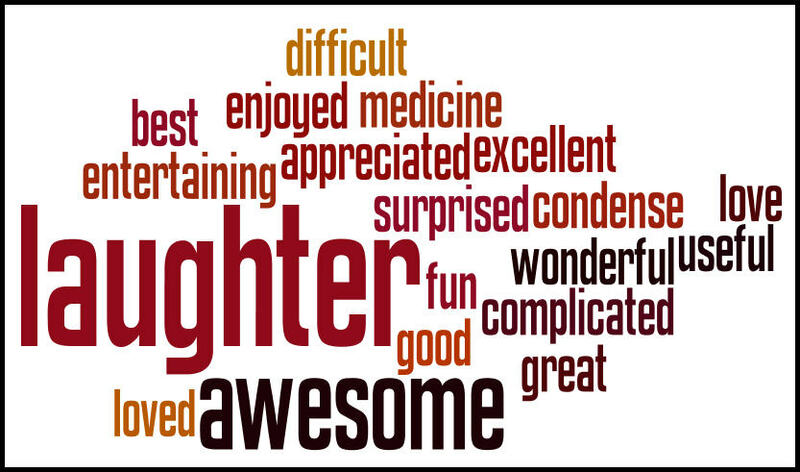 For this, I created this word cloud. Question 5: Additional questions or comments. For this, I created another word cloud. All in all, I'd say this workshop was a success and for any other trainers/staff development folks out there who might be reading this review, I highly recommend working with Charlie. He communicates well, is sensitive to the financial constraints of working with public library budgets, and has an abundance of energy and enthusiasm. This is a continuation on the three previous posts on libraries/librarians as non-sales salesmen as the concept of non-sales selling was introduced by Dan Pink in his ASTD webinar a couple weeks ago. 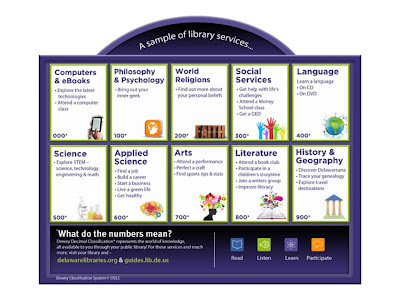 In this post, I continue to study and apply the A-B-Cs, as explained by Dan Pink, to public libraries and librarians and I'm also explore on whose shoulders these traits fall or are they (should they be) on every single library employee's shoulders? How do libraries/librarians stay afloat amid rejection and failure especially when rejection and failure can take on more forms than just budget cuts: low employee retention, failure to embrace disruptive technologies, inability to increase the number of consistent borrowers, etc. In regards to budget cuts, I believe it's important, if not essential, to have a director, or someone in the role of CFO if you will, who is politically savvy and active. We need someone in this role who is not only business-minded but who is also good at developing and sustaining meaningful relationships with the men and women who control our metaphorical and actual purse strings. Why? It seems almost a non sequitor at this point but I believe it's because of the A in the A-B-Cs. If a director cannot relate to the folks who set our budgets and control the legislation that affects us, how will he or she be able to convince them to maintain (or, better yet, increase) our funding? To not close our doors? Or to put it in non-sales selling terms, how will the director be able to convince our funding bodies of our value in order for them to want to continue to invest in it and lobby for it? But what about the other ways libraries/librarians can fail or be rejected? How do we handle low employee retention (aka high turnover)? It seems to me that there's been a push in recent years for succession planning but that hasn't taken effect across the board. I know that if I were to leave tomorrow (I'm not) that there really aren't any systems in place to take over in the chasm between my absence and the new-hire's presence. But then I wonder, how much of my own succession planning is my own personal responsibility? Should I go ahead and take measures to make sure there is something in place for when I leave my post and someone new comes in? What do you think? What are you doing to plan for succession? We also could consider failing/rejection at the micro level: programs that bomb; presentations we give that we don't ace; customer service transactions that don't quite go the way we envision; raises we ask for that we don't get. The possibilities are endless. I need to look into the ways we can prepare for rejection, experience rejection as it's happening, and recover from it afterward. I've heard mention of resources that exist but I haven't got around to researching them.But if you're reading this, maybe you can share your techniques for handling rejection! On March 21, 2013 I attended the Maryland Governor’s Grants Conference sponsored by the Governor’s Grants Office at the University of Maryland Baltimore County. This blog entry summarizes the conference’s events along with my impressions and general observations. WHAT IS THE GOVERNOR'S GRANTS OFFICE? The Governor's Grants Office was established in 2004 by the Governor. The Office coordinates State agency activities in applying for and managing federal grants. It trains and provides technical assistance to State and local government agencies and nonprofit organizations in grant-writing and identifying federal grant opportunities; and measures, tracks, and disseminates federal funding data. In addition, the Office offers an annual report, an e-newsletter, State grant announcements, conferences, and webinar training. The Office’s website provides grants information for not only state and local governments but also for residents, businesses and students. Under the Contacts tab is a list of Maryland Local Government Contacts by county which also includes public library grants collections, such as the one at WCFL. WHY A GOVERNOR'S GRANTS CONFERENCE? The conference provides an opportunity to learn about the latest trends in grants management from federal agencies, the state and foundation and corporate-giving worlds. The one-day event is usually a sold-out affair, such as this one, and features speakers and panelists from federal and state government and nonprofit foundations. Attendees were a mixture of representatives from federal, state and local government, higher education and nonprofit organizations, including a few librarians from county public library grants collections, such as myself and from Pratt and Charles, Frederick and Howard Counties. While the conference was open to the public, the registration fee requirement severely limited public attendance. Morning: The welcoming remarks were given by Barry Anderson, Deputy Director of the National Governors Conference. The morning workshops discussed federal funding with representatives of Federal agencies making up a panel discussing federal funding opportunities. This was essentially a quick rundown via PowerPoint presentation by appropriate representatives. The afternoon workshop I attended was an introduction to Maryland StateStat (website: www.statestat.maryland.gov) which is a performance measurement and management tool used by the state. This tool was originally implemented by then-Mayor O’Malley for Baltimore City as CitiStat and has since been expanded statewide since 2007. The participating state agencies submit data on key performance indicators to StateStat. This data is analyzed and used to identify areas of concern which are reported in an executive briefing. Leaders of each agency and the Governor’s executive staff hold weekly meetings to discuss the agency’s progress on selected initiatives and to develop strategies for improvement. Agency reports and summaries from every meeting can be found on the StateStat website. StateStat has partnered with other state agencies to launch the MD iMap, an interactive tool that information from agencies across the state to provide information about many improvement projects clearly and accurately. While StateStat seems an admirable program, I question whether the measurement of delivery of services can be done on such a large scale as compared to a smaller area such as Baltimore City. Opinion has also been mixed as to whether CityStat made much of a dent on the insurmountable urban problems in Baltimore. The other afternoon session I attended involved a panel session with private grantors speaking about their policies and their grantmaking. Most of the grantmakers were from well-known foundations in the Baltimore area and will not accept applications from Western Maryland. One important point emphasized in the discussion was how many applicants fail to follow simple instructions. Another point emphasized was the importance of communication in discussing eligibility for grants. The conference provided opportunities to network with local nonprofit organizations around the state. Unfortunately, attendance from Western Maryland counties was minimal. The most interesting part of the conference was the presentation on StateStat The focus of many of the workshops could have broadened from internal federal government policies and regulations. I wasn’t a big fan of the personality breakdown/management style model that was used—aren’t we all amiable, expressive, driver and analytical personality types depending on the person and/or situation we are dealing with? However, the presenters seemed very energetic and knowledgeable on the subject. The real-world examples offered helpful tools. Empathy, observation, and communication will always help one understand others. I thought the format of the workshop was great. The activities promoted a lot of discussion about management issues. By looking at each others interpersonal styles, we can decide how to approach someone with an issue. Since I am amiable style, I like to avoid conflict as much as possible! I attended the Joys and Pains of Middle Management last month. The training was very useful for remembering that we are not all the same, nor do we all like dealing with work issues the same way. Although I had learned about personality types before, it was nice to review and find out that my interpersonal style is expressive. The training gave me to time to reflect on how I perform as a middle manager (even though I have no authority over those whom I manage). After the training, I am trying to apply: thinking of others' interpersonal styles, leading by example, and delegating not only tasks but expectations. The presenters were very helpful in explaining how they handle management situations and how we can improve our work atmosphere. Having the opportunity to interact with other middle managers from the region was also valuable. James said that he tries to apply the 50/10 rule which involves 50 minutes spent on one project and 10 minutes walking around/taking a break. I can't quite imaging 50 uninterrupted minutes - it sounds glorious. I am really looking forward to having an office with a door in the new library! Another Kelly strategy that I am working on employing is having two to-do lists. The one that is endless is inevitable, but he also suggested making one each day with three things on it. The idea being that it is more reasonable to focus on a few things and if those are accomplished, one can go on to the large list, but each day brings accomplishments. The Public Services Division Unconference* on March 21st focused on adult programming, which was particularly relevant to me as we plan for our new building, with lots of new spaces for programs of different types. The unconference followed a format of small group discussions with summaries reported back to the whole group. Detailed notes were posted on the Facebook page of the Md. Adult Programming Interest Group - https://www.facebook.com/groups/172759956187770. At the event, hand out a postcard-sized evaluation form with just a couple key questions. On the card, ask for their email address and, if they give it, send them a link to a more detailed evaluation online. One of the most exciting things to arise from the unconference was a plan to create a Maryland statewide database of library program ideas and presenters. Only librarians would have access to it, and it would contain details about successful and unsuccessful programs, with handouts, publicity materials, etc. 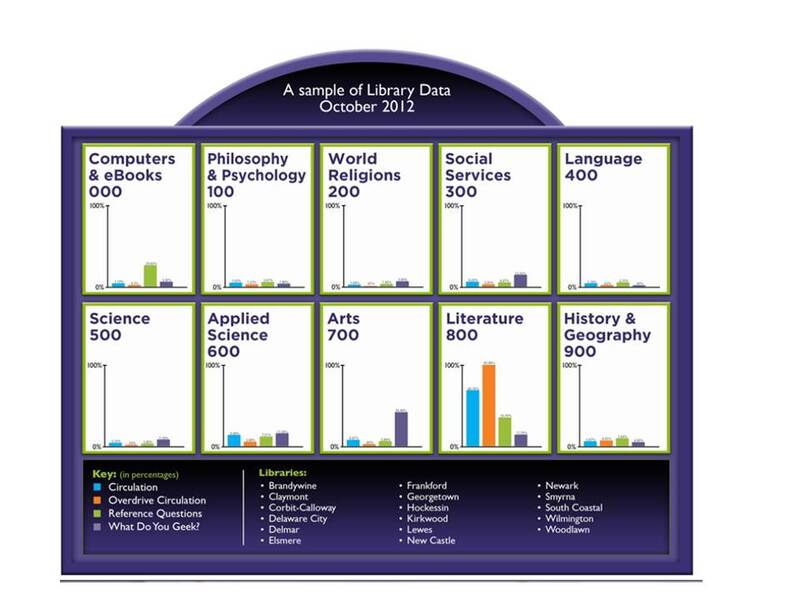 It would also contain information about presenters that libraries have used - including assessment of the quality of the person's presentation or performance. This is still in the early stages but I think it would be a very useful resource ... I'll send an email with more info when it gets off the ground. Please feel free to contact me with questions or for more information. *An unconference, if you're unfamiliar with the term, is a conference without a set agenda, and without prearranged speakers and topics. The group decides on the spot what they want to learn about, how the sessions will be conducted, and who - if anyone - will give formal presentations. There needs to be at least one coordinator to lead that discussion and to keep things on schedule, but in general it's a very democratic process. Participants benefit because they have a lot of input into the topics discussed, and because the format tends to be more discussion and less lecturing.